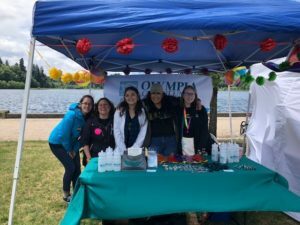 Olympia Credit Union may be considered a small local credit union, but that doesn’t stop us from making a big impact on our local community. 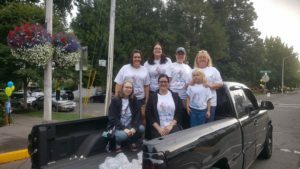 We have full staff participation in a variety of community events and do our best to volunteer where our help is needed. Our staff donates monthly to a pool of funds to be given to local charities on a quarterly basis. We vote on what charities receive these funds by suggestions from staff members or a direct request from our community. Not only are these donations helping others in need, but participating staff members get to dress down every Wednesday! In addition the Credit Union budgets designated funds to help our local charities. We look forward to being a part of our local community by embracing our human differences and collaborating together to make a difference! 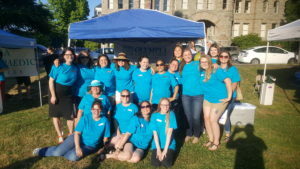 OCU staff proud to participate at the 2018 Capital City Pride event! It was a WINDY day! 2019 Pizza Klatch Gala! OCU was honored to donate a grant helping such a great cause. 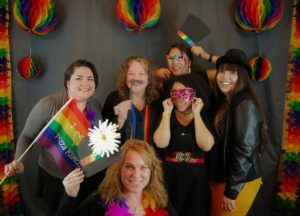 The evening was full of fun while raising awareness and providing resources to our LGBTQ youth. Our sea of teal at Music In the Park 2017 as a Concert sponsor! FULL staff participation; what a fun time! 2017 Olympia Pet Parade! Staff and family volunteer to inflate and tie balloons along the parade path, be judges for the small dogs, and perform block marshal duties. Thank you to all who support and attend local community events!